Label your silly stealer in style with this fun twist on a classic dog accessory. Of all the stuffed animals and tennis balls you've bought your pooch, nothing quite amuses them like a pair of socks. 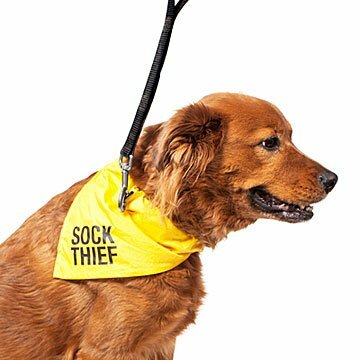 Label your furry bandit in style with this "Sock Thief" bandana. A fun twist on a classic dog accessory, the fabric has an opening to slide your pup's collar through, so it won't fall off in all the pilfering. Made in China. This style is only available in L/XL at this time. L/XL - Collar insert fits 21" L x 1.5" H collar.